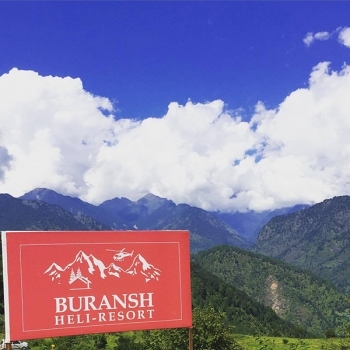 Buransh Heli Resort is a deluxe heli resort perched at a hilltop near Guptkashi. The resort offers a scenic valley view from the luxury filled cottages. The private helipad caters Kedarnath heli service and guest can take tickets directly from the counter at the resort. 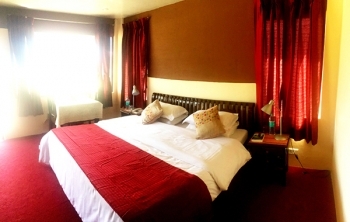 The resort is located at Devshal, 5 kms from Guptkashi main market on Jakhdhar road. The helipad in the resort serves for Kedarnath shuttle service and by armed forces. The resort has well furnished Cottages and well appointed budget tents having all amenities and facilities. Each cottage has cozy double bed, table, chairs and attach bath with hot/ cold water. The resort provides multi cuisine dinning facilities and serves mouthwatering delicious cuisines. The resort also has a prompt room service. The resort offers deluxe cottages at INR 5000/- per night. Nearest rail head is loacted at Rishikesh at a distance of 186 kms and Jollygrant Airport Dehradun is the nearest airport to reach Guptkashi.